I have been a vegetarian on and off for decades now. About two years ago during a yearly check-up I had a rather disturbing wake-up call after receiving my blood panel work up. Even though I ate very carefully I was lacking in several important vitamins and my white blood count was very low. I realized I had to take a long hard look at what I needed to do and make some changes. At that time I changed my diet to incorporate some meat, took vitamin b shots and started taking daily vitamins. 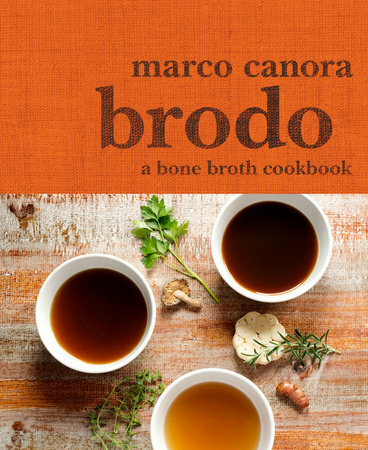 When Brodo a bone broth cookbook came across my radar I was immediately interested. Brodo is the name of the shop/restaurant that is owned by Marco Canora. He opened up for business in 2014 where he serves 3 chef crafted bone sipping broths and a seaweed broth. The broth can be drank alone or you can add-in something like freshly grated turmeric or roasted garlic puree. Other delicious options are available as well. Bone broth is nutrient dense, restorative and easy to make. What I enjoyed about this cookbook the most was realizing that broth can be sipped, like coffee or tea and how healthy it really is. I prepared the seaweed broth, which was described as a “taste like the ocean in the best way possible”. And I have to agree with him completely. I followed his recipe carefully adding carrots, celery, onions, leeks, parsnips, tomatoes, fresh and dried cremini mushrooms and dried kombu. This broth is full of antioxidants, minerals and iodine (good for thyroid health). Sure this takes hours on the stove-top but your kitchen will never smell better and you will love the flavor. I cannot remember feeling so warm and nourished after sipping from a cup. Tomorrow I will add-in bok choy, mushrooms, turnips, mung beans and toasted nori to make it even more satisfying. Another great recipe from the book. Enjoy! Hi Liz, well I have to tell you the seaweed broth is wonderful. i bet the bone broth is as well. My sister makes bone broth every week and she uses is in replacement of water in her soups etc. I was a vegetarian until I got very sick. Vitamin B12 is what you need to get if you don't eat meat, and some amino acids. I chose to eat meat and I've never looked back. A tablespoon of chicken livers a week will make a huge difference. Hi Tandy, yes vitamin b was one of the vitamins I was taking, in fact I still do. I eat egg,fish,chicken and mutton..in India,you can find 60%people are pure vegetarian,some of my vegetarian friends always advice me to leave eat non veg. .but I cant survive if I don't eat non veg..
That's very interesting Moumita, wondering if they have any trouble in how they feel. I started enjoying Indian food about 2 years ago and absolutely love it. Take care! It's so timely of your sharing as I'm looking for some vegetarian recipes to cook for my hubby due to his health reasons ^-^! Hi Karen, hope this helps, it is very flavorful. Broth is very good for us. My brother used to make porridge with just fish broth and lots of ginger. Love your seaweed broth too. Oh i bet that is delicious Angie, I love ginger and tumeric together, so healthy. I've been hearing about bone broth, so interesting to learn more about it! Sounds like a powerhouse of great nutrients! Thanks Chris, I did not realize how much until I read this book. Take care! Bone broth is very nourishing and the seaweed broth sounds fantastic also. I have 2 vegetarian friends who had the same results when they went to the doc and had to incorporate some meat into their diets as well. Hi Suzanne, I guess the old saying everything in moderation still means alot. I will try the bone broth next. Take care! Thanks Dena, this year is the year of listening to myself, we will see. Hi Kim, nori is still very new to me, finding different ways to use it. Take care! I have been hearing a lot about bone broth recently, as it seems to be the big thing at the moment. 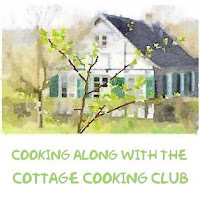 Hi Dannii, I never knew until I read this cookbook, last week we saw someone selling bone broth at the farmer's market. So surprised. Thanks Grace, I just found out about it myself. Thanks Charlie, loved this seaweed broth, so much flavor. Very interesting Cheri. I know there are a lot of great uses for bone marrow but had never heard of this book. Very intriguing and the broth sounds great. Thanks Tricia, had not prepared anything like that quite yet, but I did love the seaweed broth. Thanks Kushi, appreciate you stopping by. Thanks Beena, appreciate you stopping by. I have heard a lot about this shop in the city and I didn't realize there was a cookbook. I would love a nourishing broth like this once in a while, particularly in the winter. Kudos to you for making one at home. Hi Monica, sounds like a interesting shop. I am always learning something new in the food world. Interesting and I've seen other posts about this. My MIL made this for many years and she would be thrilled to see this! From what I now understand sounds like this is a new trend, how interesting! Take care Pam! This sounds really interesting Cheri! My daugther is vegetarian and sometimes Im worry by her ! Thanks Gloria, you are so thoughtful. Hi Vidya, I made the seaweed version, very rich and satisfying. Take care! 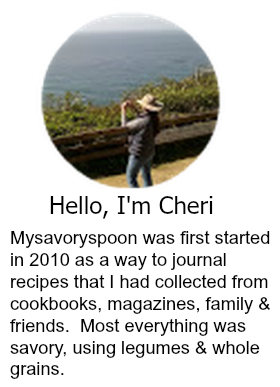 Hi Cheri, perhaps great minds think alike, I haven't tried this broth but it looks delicious- I did however, post the grass fed beef broth from Brodo on Monday, how about the timing on that?! Hi Peggy, amazing....great minds do think alike. I choose Super Foods Every Day for my next one. Thanks GG, we loved it too, so much flavor. The book sounds amazing. It is also amazing that we can heal our bodies through careful diet. Much better to eat well than to be on a series of medications. Thanks for sharing this book with us, Cheri! Hi david, you are so right, we have the power if we take the time. Hi Julie, it seems like some of us have a hard time getting enough of those vitamins and nutrients. I just started making my own beef broth this year because I have a friend who is sick with cancer and my research told me this would be very good for her particular type of cancer. I've been drinking it as well, about a half cup a day as a preventive measure against colds and flus. I haven't considered a seaweed broth so will definitely check this out. Thanks, Cheri! Hi Robyn, so sorry to hear about your friend, hope she is feeling better. The seaweed broth was very flavorful, not fishy at all. This is interesting! I saw this book too, and wondered if I'd like it. I'll give it a shot! Hi Kylee, this book was great, bone broths are supposed to be the new thing now.